The Falls Fountain, The Louisville Clock and other fails. I was watching the KET Ky channel today which aired an old documentary by Morgan Atkinson about the Falls Fountain. Not long after I started watching I had a flashback to the hype the fountain generated back in the 80’s. I was probably 9 or 10 when it was unveiled to the public who lined the bridges and waterfront to watch it start spraying. The ceremony was also broadcast live on WHAS TV to viewers that didn’t make the trek to Louisville. The Falls Fountain was supposed to be our attempt to attract tourists to Louisville as a world class city. Supporters of the fountain said it would rival the Eiffel Tower, and the St. Louis arch. It was located out in the middle of the brown water of the Ohio River, and shot a stream of river water higher than the Humana building (the one to the right). The fountain was a huge metal box rising several feet out of the water and painted a greenish/primer color, similar to the Statue of Liberty. It had a 530 sq. ft. pump house inside the floating metal hulk that was the size of a small apartment. The pumps and equipment were plagued from the start by the amount of debris floating in the river. Breakdowns were frequent and it seemed it was down for repair, more often than it was working. The fountain got a new camo paint job in 1992 and was finally taken out of commission once it became too expensive to maintain. It was sold for scrap to a private owner in 1998 for $15,000. The LeoWeekly had an excellent article about the great fountain. The PR blitz ahead of the fountain’s launch was so overwrought, the fountain couldn’t have lived up to expectations even if it sprayed free Makers into to-go cups on the Belvedere. I remember my 6th grade class going to the Belvedere and the natural science museum, the fountain was in the background. I have been to Louisville several times in recent years and didn’t realize the fountain was gone until I caught the documentary. It never became a St. Louis arch, but it made Louisville logos and news intros for years. The moral of the story is that spending money on a mechanical gimmick to attract tourism = fail. Searching the system of tubes reveals limited information on the fountain project, and even fewer pictures. Some blogs and websites compare the fountain failure to that of the Louisville Clock, aka: Kentucky Derby Clock, which was a complicated mechanical clock complete with a horse race at certain times of the day. It was built in the early 70’s and modeled after a toy music box, with a horse racing theme. I had forgotten seeing this clock as a kid, it was easily more forgettable than the Falls Fountain. This was on a different trip to Louisville. I think my parents walked by it and mumbled something under their breath about a total waste of money and ushered us kids on to the next attraction. Its was impressive, but not as impressive as the Eiffel Tower. The track featured caricatures of Daniel Boone, Thomas Jefferson, Zachary Taylor, and others racing around the track and musicians in the bandstand. This Rube Goldberg type machine was built in the 70’s to be displayed inside the River Falls Mall which became the Galleria Mall, which became 4th Street Live. It never really worked, in part due to the 100 foot long belts inside the racetrack that sends the metal horses around the track. The Adam Matthews Foundation is working to restore the Derby Clock and get it repaired for all the public to enjoy. They are taking donations and volunteers to help with wiring and other restoration tasks, and more information is available on their website. The clock is at Bowman field undergoing repairs and the site claims it will not have a permanent home until it can run on its own without mechanical breakdowns. Remember the ruckus the Floral Clock in Frankfort caused? Governor Burt Combs’ pet project that drew fire as a waste of money in the 60’s, is actually a state attraction that worked. The floral clock is still sitting on its 100 ton pedestal and maintained by the Garden Club of Kentucky. If this clock was part of the motivation for the Derby Clock, its no wonder the designers thought it would draw a crowd. The next gimmick we have in the works to draw a world-class crowd is the World Equestrian Games. Lexington has bent over for this one, throwing money and resources into the Centrepoint building development. In doing so, it leveled one of the historic city blocks and took away 5 or 6 authentic bars to build a hotel to house all the VIP’s that are supposidly coming to Lexington for the games. 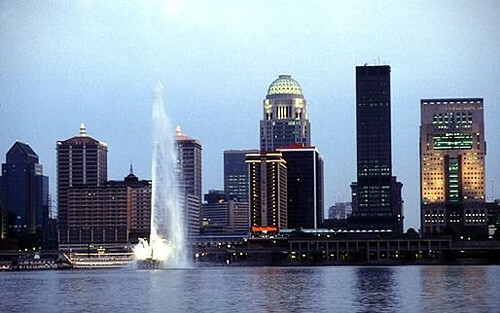 I love highrise buildings, but if Kentucky history tells us anything about the hollow promises of building things in hopes of drawing a crowd, maybe we should look at the Falls Fountain and the Derby Clock for insparation before we get too involved financially. Sometimes even if you build it, they don’t come.